It’s here! It’s here! It’s finally here! I’m so glad to announce that the Nine Nights of Narnia has officially begun! Today, my first post will concern my first encounter with Narnia. I came to the series rather differently than most folks. As an eighties-born child growing up in the nineties, the grandiose Walden Media films were not available. I was also not introduced to Narnia with the books. My mother, an avid reader, was an enormous Tolkien fan, but had trouble getting into the Narnia series, so they weren’t read to me growing up. No, it was my librarian who introduced me to the great Chronicles penned by C.S. Lewis, but not with the books. My elementary school library had a worn-out old VHS tape of the 1979 cartoon version of The Lion, the Witch, and the Wardrobe. Because my mother was a teacher and worked at the school, I would frequent the library in the afternoons to read and borrow VHS tapes to watch in my mother’s classroom. I borrowed this VHS so often that eventually, the librarian (a fabulous Southern Belle, complete with the accent) gave it to me. The elementary was probably trying to downsize its unused collection items, but I still remember her giving it to me and I’m forever grateful to her for introducing me to the wonderful world of Narnia. If you’ve seen this version of the film, you’ll know that it isn’t really all that great animation-wise. However, this film adaptation goes almost word-for-word by the book. As a child, I ADORED this film. It made me want to read the books and for Christmas one year, my parents bought me a very handsome set of all seven books (which I devoured soon after). This is the style of books that I had. LOVED their covers. I think I sold them a while back, though, when my hubby and I got married. 🙁 Wish I still had them. They were GORGEOUS. The Lion, the Witch, and the Wardrobe is my favorite of all the books, but a close second was The Horse and His Boy. I was also partial to The Magician’s Nephew and The Last Battle. But, I really love all the books. 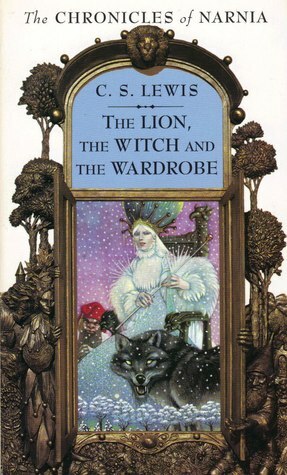 As an adult, I’m still obsessed with Narnia and C.S. Lewis. I’ve watched (this year alone) the Walden Media adaptation of The Lion, the Witch, and the Wardrobe at least 4 times or so. I’m listening to the audiobook version (narrated by Michael York) at the moment and yet…the story never gets old. What was your first encounter with Narnia? Please, please share in the comments section! I’d love to hear about it! Be sure to drop by tomorrow for my favorite Narnia novel review! ← Meet C. Elizabeth Vescio, Author of ‘Elegantly Wasted’ // Giveaway Included!